I will be in Italy for the first time this spring. I will be in Florence May 19th, 20th & 21st and traveling to Rome on Wed. May 21st. Will be leaving Sat morning May 24th. I need some help planning the best itinerary. I realize that my first day in Florence is Monday and many places will be closed. Also, will it be worth it to buy the Firenze and Roma passes that will allow me to bypass the museum lines? Would it be better to book a tour or view on my own? I will be with 2 girlfriends. We are all early 60's, pretty fit and good walkers. Thank you in advance for any help you can give me!!! IMO the Firenzecarta is wildly overpriced at €72, even though it does include transport in the city. Why? you only have 72 hours to use it and it will be very difficult to get your money's worth in those 3 days, especially as the centre of Florence is very walkable. therefore you are highly unlikely to get your money's worth. but it would be a good idea to prebook entry to the Uffizi and the Accademia if you are interested in going there. The Roma card is better value, you get free entry to the first two places you use it for plus some other discounts, and most importantly it allows you to bypass the main entrance line for the Colosseum, though it must be said that there are other ways of doing this, like booking tickets or a tour of the Colosseum in advance. if you are going to do any tour, the Forum would IMO be the best place to do it - many people, including me, find it very difficult to understand what they are seeing, and unlike the Colosseum the signage is appalling. the other place where pre-booking is a good idea is the Vatican - and it is not covered by the Roma pass. of course, you can get into St Peter's for free; the admission is to the vatican museums, a tour of which culminates in the Sistine Chapel. A rear door enables you to gain entrance to St Peter's without retracing your steps through the museum and round the Vatican wall, though sometimes it's shut. for both cities, my main suggestion is to try to group your sightseeing together -also taking into account opening times. for example. in Rome you could see the Forum and Colosseum, followed by the Capitoline museums. A good guide book should have some more ideas, and for other things you can do in 3 days or so. The Bargello Museum in Florence will be open May 19th. This official website for Florence museums will help you figure out what things are open when. And this unofficial website lists Florence sights, both museums and others. Thank you!!! You have been very helpful!!! do come back, Marcia, when your plans are a bit firmer and perhaps some other people will chime in to help you. also, there are quite a few recent threads about trips to Rome and to a lesser extent Florence, if you search this forum. While we're talking about Florence, can I give a plug for the area around Santa Croce? it's a little bit away from the tourist hoards, but if you've ever read or seen the film of EM Forster's "A Room with a View" it will be quite familiar to you. The church itself is very beautiful, and as a contrast, there is a market a couple of blocks north which lots of lovely stalls and a very good cafe serving typical florentine food at very good prices. There are lots of interesting local shops as well - from bicycle repairers to chair re-caners, plus a very cheap and good gelateria. A morning there [the market will close in the pm] would make a nice antidote to the crowds around the Duomo and the Ponte Vecchio. I second the suggestion of the Santa Croce area. The church will be open on Monday. It is a fascinating place to explore with its great art. It is also the burial place of many famous Italians. The best (IMO) gelato in Florence is just a block away. I'm sorry, I can't think of the name right now. While visiting the "Roman Forum" be sure to have a drink from one of the fountains there, the springs that feed it are your namesake after all . The same springs far outside of Rome that used to supply the Aqua Marcia now also supply water to the Roman Forum. Of ancient Rome's 11 aqueducts the Aqua Marcia (140BC - 91km) was *the* best tasting and the coldest. A few ancient writers have commented about this water (best, coldest) including Pliny who also said it was wholesome (healthy). 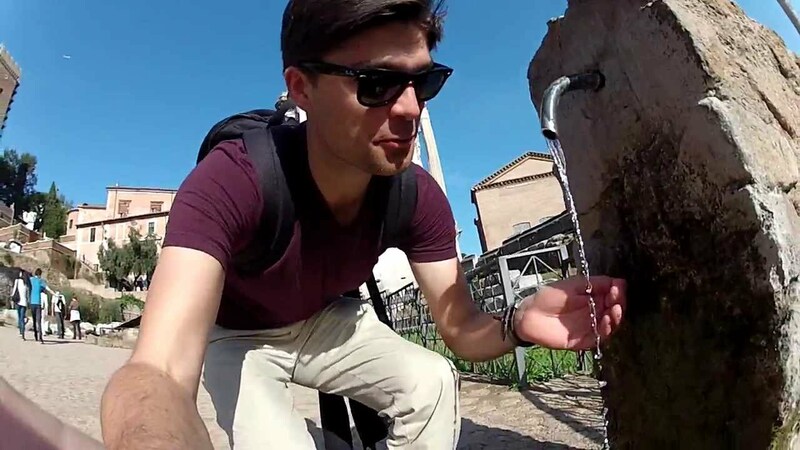 Those springs were tapped again in the later 1800s for Rome's drinking water and were tied-in to the hundreds of outdoor drinking fountains through-out Rome. Rostra, when I was in Rome last year, I kept a water bottle with me to fill up at any convenient point, much to the astonishment of my colleagues, who didn't know about Rome drinking fountains. Once they did know they followed suit. Later on in the trip, we were all queuing up to fill our bottles in the Forum when a french family came past and thoroughly berated their son with the information that he was NEVER to do such a terrible thing as to fill his water bottle from a public fountain. poor child, what a treat he missed. IMHO, the Roma Pass will be perfect for you and your friends, as long as you use it at a minimum of 3 sites. You can pick it up at the Termini station when you get off the train. Or you can pick it up at one of a dozen PIT's (these are tourist information booths). I would highly recommend that you use it the first or second time at the Colosseum. This is because you won't have to stand in line. Look for the entrance opening to the left of the main line of people waiting to get in. You will either see a Colosseum employee in uniform, or a sign that reads, "ROMA PASS". Other great places to use the Pass are at the Galleria Borghese (you must call and make a reservation first), the Capitoline Museums and the Castel Sant'Angelo. The transportation portion is great because it allows you to ride any bus/tram/Metro/regional train within the city limits. The transportation piece expires at midnight on the 3rd day of use. The Roma Pass site has a great Metro map you can look at. The public transportation system in Rome is terrific, in my opinion. And while much of Rome is "walkable", if you have walked all over Florence, it is going to get tougher as you go. Additionally, nice to know you can just hop on a bus/tram/Metro if you don't feel well and want to get back to your hotel quickly. And/or if the weather gets bad! Have a fabulous trip! I love both these cities! I am by no means an expert having only been to Italy once, but I can share my favorite experiences. I wholeheartedly agree that Santa Croce in Florence was wonderful . I was awestruck by il Duomo. I suppose that is what is supposed to happen. : ) We also loved wandering the Oltrarno district. We found a walk on the web just by entering Oltrarnowalk. I think it was through back trails ( a hiking site, but it wasn't a hike.just a nice walk). In Rome, Borghese Gallery was my absolute favorite, but Sopra Minerva and the Colosseum were up there too. If you decide on the Borghese, make reservations ahead of time. They were sold out for 3 days when we were there. Thank goodness we had our reservation. We also did an interesting food walk through Walks of Italy . We tried meats, cheeses, delicious balsamics and olive oil and made pizza at a local restaurant. A little touristy,but it was fun and we were tourists. Also had a terrific dinner at Atmando al Pantheon, make reservations. Have fun.